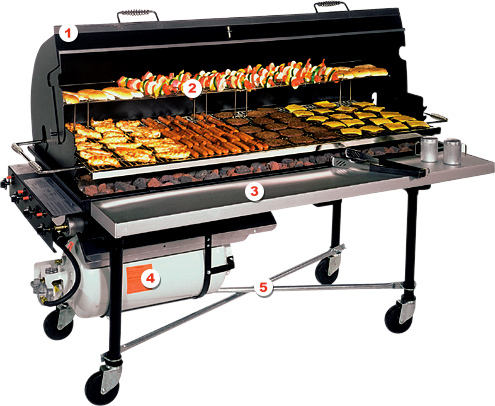 gas, charcoal, mesquite or log-burning model PORTA-GRILL® in minutes. PG-2460-II, PG-2460-I, PG-2460-M, PG-2460-W, MOBILE-II, MOBILE-I, MOBILE-M, and PG-2460-WT. Bread-Box Hood (with thermometer) | Speeds up cooking time and conserves fuel. Warming Rack | 60" wire warming rack lock on & off the cooking grate. 8"W x 6"H.
60" Removable Shelf | 2"H x 10"W x 60"L. Rigid steel supporting brackets hold shelf in position for easy accessibility. Easy to install. Easy to remove. The heavy-duty aluminum shelf with its simple to clean, sanitary anodized surface is impervious to fats, oils and greases. The shelf of choice for health departments everywhere. 40lb Gas Cylinders | Avoid running out of propane during the big event. Horizontal cylinder with an overflow protection device. MOBILE-SLP, MOBILE-SLPX, PG-SNG, PG-SNGX, PG-SLP, PG-SLPX. Stainless Steel Hood | Speeds up cooking time and conserves fuel. 40lb Gas Cylinders | Avoid running out of propane during the big event. Vertical cylinder with an overflow protection device. Warming Rack | 30" wire warming racks lock on & off the cooking grate. 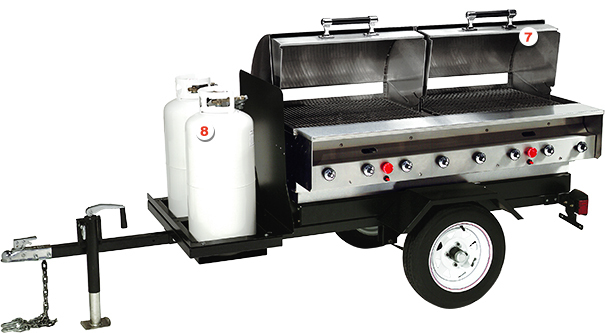 8"W x 6"H.
All Weather Cover | Our All Weather Cover is designed to fit all PORTA-GRILL® mobile and caster models. This cover will protect your grill from weather damage. Made of industrial grade polyethylene. It is tear and rot resistant, waterproof, and won't crack even in sub-zero temperatures. Superior construction includes contour fitted hood profile, tightly woven nylon strands in a polyethylene mat, double-strong rope reinforced hems and fourteen rust proof brass plated grommets at the bottom, four along each side and three at each end.